One of the most lucrative credit card category spending bonuses, and the reason I love the Ink Bold and Ink Plus cards from Chase so much is the ability to earn 5X points per dollar you spend up to $50,000 a year each at office supply stores. Granted, very few businesses actually need to spend that much on office supplies, but big box stores like Office Depot and Staples actually stock a diverse range of products, including gift cards to various merchants as well as Visa and Amex gift cards (which do come with fees of around $3-5 each) that you can then use like normal credit cards on other purchases and earn 5X points per $1 instead of just 1X points per dollar. Although some credit cards exclude gift cards from bonus spending categories, the terms of the Ink cards state: “You do not earn points on cash-like charges such as travelers checks, foreign currency, and money orders, overdraft advances, unauthorized or fraudulent charges, or fees of any kind.” That list excludes gift cards, so they are still eligible for the spending bonus, and you can earn 5X points on any number of purchases in-store, but by paying attention to what gift cards are available through the major retailers’ websites, you can double dip and earn even more Ultimate Rewards points. I even spoke to Chase reps recently who confirmed that buying retail gift cards is not “gaming” and is within the rules of the program. Things did get hairy when people were buying huge quantities of Vanilla Reloads at Office Depot (and they’ve since been pulled), but my understanding is that retail gift cards are fine. While the actual inventory of gift cards can vary from store to store, I love Staples.com because it allows you to order fee-free e-gift cards from a number of retailers. 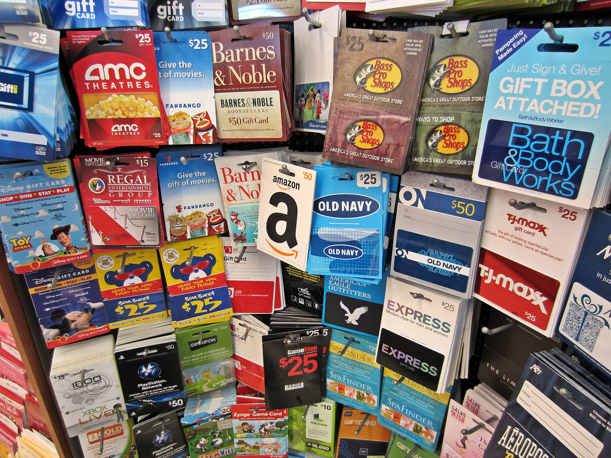 For actual inventory in your store, you really need to go into the store or call ahead, so I’ve included gift card links and store locators for the top 3 big box retails in addition to the online Staples cards. Other popular gift cards available in store include Starbucks and other restaurants. Regularly you would earn 1 mile per $1 for these gift cards, but Office Max seems to charge a $.99 fee, so basically for 99 cents you’d be getting an extra 100 Chase points if you bought a $100 gift card, which I still feel is worth it, especially if you add on portal bonuses (though these points are not guaranteed, but some people have reported getting them on gift card purchases). While you might have trouble spending $50,000 a year at TJ Maxx or Red Lobster, by really perusing the shelves for gift cards, you can generate a lot of spending at all kinds of merchants including at gas stations like Shell, at different restaurants, on furniture, on movie tickets, gifts and more. In fact, now that graduation season is upon us, you could consider getting the grad you know some useful gift cards including those from Amazon (where you can pretty much buy anything these days), Barnes & Noble or Bed, Bath & Beyond. Their dorm room will be stocked in no time! 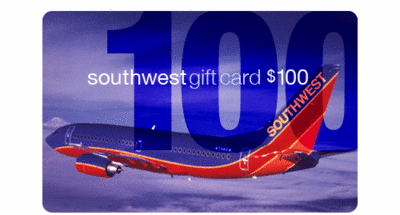 Buy a Southwest Airlines gift card in an office supply store and earn 5x Ultimate Rewards points with your Ink card. For Southwest travelers, this is also a major boon since you can use your Ink card to earn 5X Ultimate Rewards points per $1 (which also transfer to Southwest if you have the Ink Bold, Ink Plus or Sapphire Preferred) and use it to pay for a Southwest gift card then use that for Southwest travel, earning the Rapid Rewards points you would on a flight the same as if you paid for it in cash, so that’s a nice little double-dip option. Same with Marriott gift cards if you’re aiming for some Marriott Rewards points (another Ultimate Rewards transfer partner). You could also use your Ink Bold or Plus to buy prepaid cards, although many of these carry fees, and then just use those at merchants where you wouldn’t be earning any bonus points anyway to earn 5X instead of 1X points per dollar. Just beware that if you’re buying Amex gift cards for $3.95 each with a $200 limit (back in February Office Depot pulled the $500 prepaid cards), you’re getting an extra 800 points for $3.95, or about 0.5 cents each. That’s a bargain in my book since I value Ultimate Rewards points at 2 cents each – so you’re literally getting 4 times the value from them, but it’s something to keep in mind. 2. You can check the Ultimate Rewards shopping portal to see if there are any additional spending bonuses at these particular stores. To see what merchant-specific spending bonuses Ultimate Rewards is offering, go to UltimateRewards.com and log in with your information. Then click on the Earn Faster tab and it will pull up the shopping portal where you can search by merchant. The current office supply store spending bonuses through the Ultimate Rewards portals. So if you were to go through the Ultimate Rewards portal to one of those sites and then buy gift cards online with your Ink Bold or Plus, not only would you be earning 5X points per $1, but you’d also be earning an additional 2-3 points depending on the merchant for a total of up to 8 Ultimate Rewards points per dollar, which is an amazing value. Both Office Max and Staples offer a lot of the same gift cards you’ll find in-store online, so instead of getting just 5X points per dollar and having to schlep into a store, you can just click away from the comfort of home and earn an extra 2-3 points per dollar. Southwest and Marriott cards are not available online– so no triple dipping here. Office Depot is the major exception – they only sell their own gift cards. It’s unclear if you can then take these in to use them to buy other gift cards (though if anyone has experiences doing so, please report below! ), but even if you’re just buying these for office supplies, you’re earning 8X points per $1 instead of just 5X points. Before you go charging up $50,000 at once in gift cards, keep a few things in mind since you don’t want to raise any red flags with Chase. In addition to spending as much as possible at bonus category merchants, be sure you use your Ink Bold or Plus at non-bonus merchants as well to be a good overall customer. I also have auto loans and savings accounts with Chase since I like to reward them for being so rewarding to me! Pace your spending – don’t blow through the $50,000 annual limit in a couple months, but pace it out as evenly as possible so as not to cause the bank concern. Watch your balances and debt. Don’t go ruining your credit by spending irresponsibly just to pick up these bonus points. Create a deep, diverse relationship with Chase – the more accounts you have and the different kinds of accounts you have make you a more attractive customer to the bank and one it is less likely to view as taking advantage of the points system. That said, the Ink Bold and Ink Plus 5X office supply category spending bonus is one of the most lucrative points-earning opportunities on the market. Buying gift cards at these stores is a great way to rack up tons of extra Ultimate Rewards points, even if you’re not spending your money on actual office supplies. Share your thoughts – have you used gift cards to amplify your Ultimate Rewards earnings? If so, how?